Brain connectivity analysis has become central in neuroscience. However, this ever-growing field has yet to be thoroughly systematized. For instance, questions like “how should I pick an appropriate connectivity measure for this type of experimental data?” or “how should I interpret the outcomes of my connectivity analysis?” are not often guided by textbooks or papers. 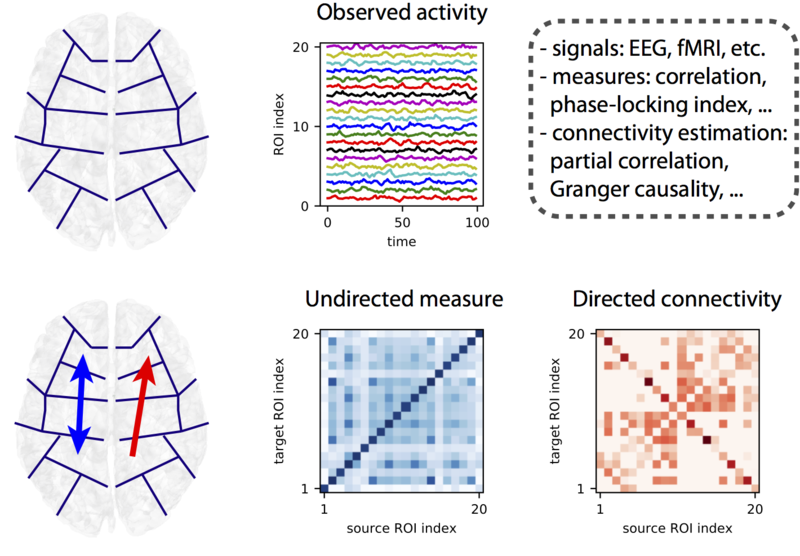 In this one-day workshop, we propose an overarching guide to navigate through the concepts and methods for the connectivity analysis from observed neural activity (time series). First, in the ‘theory and concepts session’, we will review the most common connectivity methods (e.g., linear, directional, multivariate) and present synthetic network examples to compare them. The goal is to obtain insight about the interpretations of these measures. In the ‘hands-on session’, we will provide a few more synthetic examples where to apply the reviewed connectivity methods. We also encourage you to bring your datasets and put in practice your acquired knowledge.